APRA has released a paper on Loss-Absorbing Capacity of ADI’s. 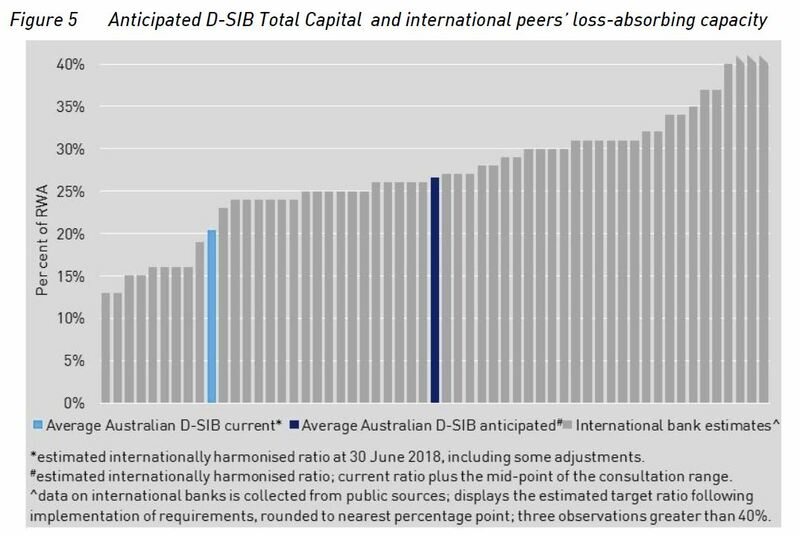 It shows that currently major Australian banks are at the lower end of Total Capital compared with international peers. As a result of proposed changes, major banks (Domestic systemically important banks in Australia, D-SIBs) will see their funding costs rise – incrementally over four years – by up to five basis points based on current pricing. This is intended to build in more financial resilience by lifting the capital requirements, centred on tier 2. Other banks may also be impacted to an extent. If the D-SIBs were to maintain an additional four to five percentage points of Total Capital they would have ratios more in line with their international peers. But not in the top 25%, and the banks overseas are also lifting capital higher… so some tail chasing here! Is this “unquestionably strong”? Under the proposals, each D-SIB would be required to maintain additional loss absorbency of between four and five percentage points of RWA. It is anticipated that each D-SIB’s Total Capital requirement would be adjusted by the same amount. By way of background, the Australian Government’s 2014 Financial System Inquiry (FSI) recommended APRA implement a framework for loss absorbing and recapitalisation capacity in line with emerging international practice, sufficient to facilitate the orderly resolution of Australian ADIs and minimise taxpayer support (FSI Rec 3). The Government supported this recommendation in its response to the FSI. APRA’s role is not to eliminate failure altogether, but to reduce its probability and impact. This role is set out in APRA’s statutory objectives under the Australian Prudential Regulation Authority Act 1998 and the Banking Act 1959, which require APRA to protect depositors and pursue financial system stability. In performing its functions, APRA will balance those objectives with the need for efficiency, competition, contestability and competitive neutrality in the financial system. Disorderly failures are inconsistent with APRA’s objectives, as they are highly disruptive to depositors and have an adverse impact on financial system stability. Australia has not experienced a disorderly ADI failure in recent history, though the failure of HIH Insurance Limited (HIH) in 2001 provides an example of the adverse consequences of a disorderly failure of an APRA-regulated institution. In that instance, policyholders were severely affected and essential insurance services to the broader community became unavailable for a period of time. Conversely, orderly resolution of an ADI would occur when a problem is identified and escalated early enough to allow APRA and other financial regulators to manage and respond in a manner that protects the interests of depositors, stabilises the ADI’s critical functions and promotes financial stability. Achieving an orderly resolution does not necessarily mean a crisis is averted, rather the manner in which an ADI’s failure is managed would result in better outcomes given the circumstances. APRA’s statutory powers were recently strengthened by the passage of the Financial Sector Legislation Amendment (Crisis Resolution Powers and Other Measures) Act 2018. The effectiveness of resolution planning will be a focus for APRA over the coming years. APRA is in the process of developing a formalised framework for resolution planning and will consult further on this in 2019. The proposals in this discussion paper focus on the availability of financial resources to support orderly resolution. These proposals would ensure ADIs have adequate financial resources available to support orderly resolution in the highly unlikely event of failure. This will be achieved by adjusting, where appropriate, an ADI’s Total Capital requirement. These proposals are distinct from APRA’s work on ensuring ADI capital levels are ‘unquestionably strong’, which relates to the ongoing resilience of institutions and is in response to a separate FSI recommendation (FSI Rec 1). for other ADIs – likely no adjustment, although a small number may be required to maintain additional Total Capital depending on the outcome of resolution planning, which would inform the appropriate amount of additional loss absorbency required to achieve orderly resolution. This assessment would occur on an institution-by-institution basis. Tier 2 capital instruments are designed to convert to ordinary shares or be written off at the point of non-viability, which means they will be available to absorb losses and can be used to facilitate resolution actions. Tier 2 capital instruments have been a feature of ADI capital structures in various forms since being introduced as part of the 1988 Basel Accord. These instruments have been used as part of resolution actions in other jurisdictions, supporting orderly outcomes. It is also important that holders of instruments which are intended to be converted or written off in resolution understand the distinctive risks of these investments. In the context of AT1 instruments, APRA has noted that it is inadvisable for investors to view such instruments as higher-yielding fixed-interest investments, without understanding the loss-absorbing role they play in a resolution.15 In the case of the Australian ADIs’ Tier 2 capital instruments, these are mostly issued to institutional investors, who are likely to understand the risks involved. 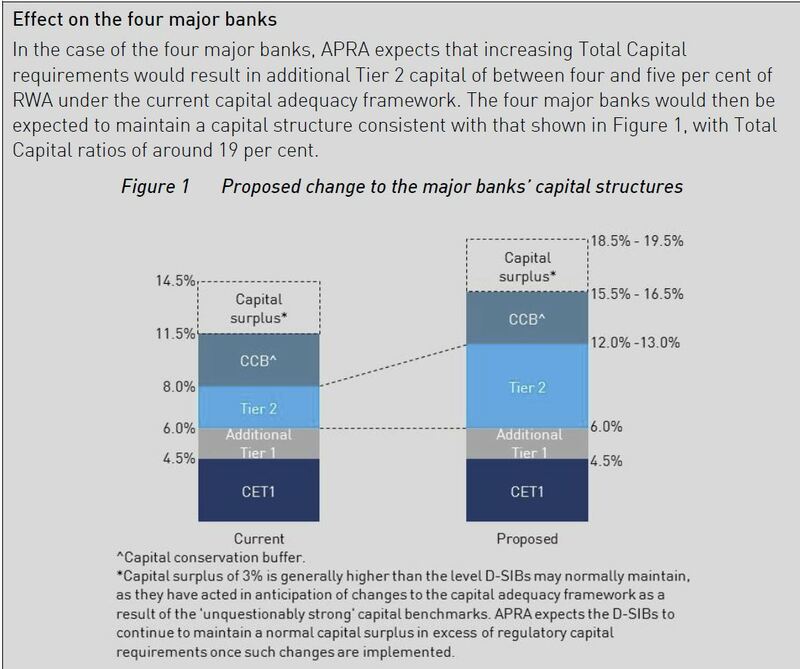 As ADIs will be able to use any form of capital to meet increased Total Capital requirements, APRA anticipates the bulk of additional capital raised will be in the form of Tier 2 capital. The proposed changes are expected to marginally increase each major bank’s cost of funding – incrementally over four years – by up to five basis points based on current pricing. This is not expected to have an immediate or material effect on lending rates. APRA proposes that the increased requirements will take full effect from 2023, following relevant ADIs being notified of adjustments to Total Capital requirements from 2019. In addition to the proposals outlined in this discussion paper, APRA intends to consult on a framework for recovery and resolution in 2019, which will include further details on resolution planning. APRA Chairman Wayne Byres said one of APRA’s core functions as Australia’s prudential regulator is to plan for, and if required, execute the orderly resolution of the financial institutions it regulates. “The resilience of the Australian banking system continues to improve, underpinned by the build-up of capital over the last decade. “However, no matter how resilient financial institutions are, the possibility of failure cannot be entirely removed. Therefore, in addition to strengthening the resilience of the financial system, it is prudent to plan for the unlikely event of failure. “The events of the global financial crisis demonstrated the impact that failures can have on the broader financial system and the subsequent social and economic consequences. “The aim of these proposals and resolution planning more broadly is to ensure that the failure of a financial institutions can be resolved in an orderly fashion, which protects the interests of beneficiaries and minimises disruption to the financial system,” Mr Byres said. Has the great Aussie bond rocket flamed out? All hail the Deep One! No wait, that’s our current banking system. My bad. All a bunch of unquestionably cobblers. At some point could we at least have a sniff of a discussion of the lunacy of building a public monetary system around private bank liabilities as public money. Banker’s Pseudo fiat remains an excellent description. If we want unquestionable strength what we need to do is expand the role of the liabilities of the central bank (aka RBA). Liabilities of the RBA are unquestionable strong by definition. Currently the ratio of central bank liabilities to private bank liabilities is about 1 to 19 and for no other reason than some bunch of banker rent seekers thought it would be really nice if the nation used their Pseudo Fiat instead of the real stuff made by the Central Bank. Expanding the role of Central Bank liabilities is not hard either. Just allow the general public and non-banks the right to operate directly deposit accounts at the RBA. How many people realize only the banks are currently allowed to operate deposit accounts at the RBA and the RBA pays them the overnight rate of 1.25% on their balances. How many people are getting that from the private banks on their deposits? That one single step will immediately create demand for Central Bank liabilities and result in a shift of deposits from the private banks to the RBA. If the banks want to secure a supply of unsecured loans from investors they can continue to do so but they can pay for them instead of demanding the RBA drive them in their direction like a herd of fat cows. “..It is time to have a closer look at the Reserve Bank of Australia “RBA” as any serious reform of the role of the private banks in the Australian monetary system must involve reform of the role of the Central Bank (i.e. RBA) in that monetary system. Reform of Australia’s monetary system involves expanding the role of the RBA in a very specific but limited way. You’re doing great job on it. You are giving the regulators some excellent attention and plenty of food for thought. APRA proposes that the increased requirements will take full effect from 2023……Needn’t bother, they’ll be toast long before 2023. Interesting the statement that ‘Depositors’ will be protected not ‘Deposits’. Martin North made the same distinction because they are using that phrase quite deliberately. Yup. By 2023 we will have a freshly recapitalised banking system, and, quite possibly, a brand spanking new monetary system. Oh, and a new regulator. Uh, no-one cares about this. They’re too busy checking the Spotify playlists of white male politicians. When will you people get it? Capital is for when you are picking over the bones after the smash….liquidity is the go……but when lying is allowed ? This is the money shot paragraph…instruments which are intended to be converted or written off in resolution..ie hybrids and other instruments they define (which can be anything due to their absurd catch-all clauses). Almost none of the punters that punt (not invest) in those instruments understand this…. Well, it’s much easier to dismiss the complaints of professionals (who should know better) than it is those of mom ‘n pop investors whose life savings were decimated and now they are homeless etc (all played out on every TV news channel). ANZ estimates it will need an extra S16-20b, according to their ASX announcement at 2.15pm today. “The paper proposes an increase in Total Capital requirements of between 4% and 5% of risk-weighted assets (RWA) for domestic systemically important banks (D-SIBs), such as ANZ. Based on ANZ’s RWA of $391bn as at 30 September 2018, this represents an incremental increase in the Total Capital requirement of approximately $16 billion to $20 billion, with an equivalent decrease in other senior funding. “APRA anticipates that D-SIBs would satisfy the requirement predominantly with additional Tier 2 capital. D-SIBs will need to satisfy the new requirement by 20232. Tier 2 bank capital must be one of the most unattractive investment options available. Who needs risk like that?